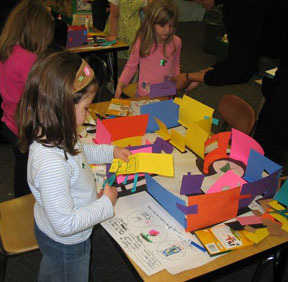 Is your child interested in architecture and design? There are many ways to spark the interest of a young child: provide access to good books about houses and homes, places and spaces, buildings and structures; and provide building toys — the kind you buy, plus large-scale “found” building materials. To support children of all ages, share their enthusiasm: encourage them to observe, draw and photograph interesting places, spaces and buildings; and encourage them to develop and draw their own design ideas. For older children, you could first provide a simple set of drafting tools: a drafting board, T square, triangles, scale templates, graph and tracing paper, a pencil and a good eraser. Have them try building scale models from materials like small, plain boxes, oaktag or cardboard or foamcore. Supplement their drafting tools with a simple CAD (computer-aided-drafting) program, while continuing to encourage the hands-on work of drawing and model-building. Inexpensive CAD programs can be a good start; and CAD programs of varying complexity can be downloaded from websites. Reading books about architects and architecture, and going to the AIA’s ArchCareers website. Browse our resources page and look into community programs in Massachusetts, including Archi-Camp (SMARTS Collaborative Attleboro); Architecture Studio at DesignCamp (UMass Lowell College of Engineering); Center Summer Academy (Boston Architecture Center); Career Discovery, Harvard Graduate School of Design; and Pre-College Design Academy, Umass Amherst. Note: Out-of-state parents – please contact A+DEN (Architecture & Design Education Network) [#] to learn about local K-12 programs, and American Institute of Architects to find local AIA organizations.